Periodically, America experiences episodes of mass, hysterical contagion. What is “hysterical contagion”? A sociologist explains it as the spread of symptoms of an illness among a group, absent any physiological disease. It provides a way of coping with a situation that cannot be handled with the usual coping mechanism. For example, in 1983, girls in the West Bank fell ill, one after the other. Soon, all the schools and finally the entire community was engulfed, affected with the same symptoms. Arab doctors implicated the Israelis. But of course. The Israeli Occupation had poisoned the girls by gas to reduce their fertility. When real doctors arrived on the scene to examine the neurotics; the girls were pronounced physically healthy. The frenzied behavior known as mass hysteria or hysterical contagion is well documented. The Trump-Russia “collusion,” “obstruction of justice” probe qualifies, with an exception: This particular form of mass madness involves a meme, a story-line, rather than the physical symptoms observed in the West Bank. Rumor recounted as fact for which no evidence can possibly be adduced: Indeed, the Establishment and opposition elites have poisoned the country’s collective consciousness. However, it’s the emotional pitch with which the Trump-Russia collusion group-think is delivered, day in and day out, that has gripped and inflamed irrational, febrile minds. What sociology terms “a collective preoccupation” is fueled by organizational and communication networks. Friendship networks (the liberal kind) and work organizations (government departments infested with like-minded individuals) serve as nodes in a system that transmits faulty signals across the synapses of this collective, damaged brain. When you’re the most powerful entity in the world, as the US government certainly is—the only government to have dropped nuclear bombs on civilian populations (“good” bombs, because dropped by the US)—you get to manufacture your own parallel universe with its unique rules of evidence and standards of proof. What’s more, as the mightiest rule-maker, you can coerce other earthlings into “sharing” your alternate reality. Or else. The manufacturing of Fake News by the Deep State, circa 2017, is of a piece with the anatomy of the ramp-up to war in Iraq, in 2003. (Chronicled in achingly painful detail in Broad Sides: One Woman’s Clash With A Corrupt Culture.) Except that back then, Republicans, joined by diabolical Democrats like Hillary Clinton, were the ones dreaming up Homer Simpson’s Third Dimension. To manufacture consent, elements in the intelligence community worked with neoconservative counterparts in Bush 43’s administration, in particularity with “the Office of Special Plans.” And while Fake News babes did wonders for the cause of senseless killing—the dissemination of Fake News vis-a-vis Iraq was hardly the exclusive province of Fox News. With some laudable exceptions, Big Media all was tuned-out, turned-on and hot for war. 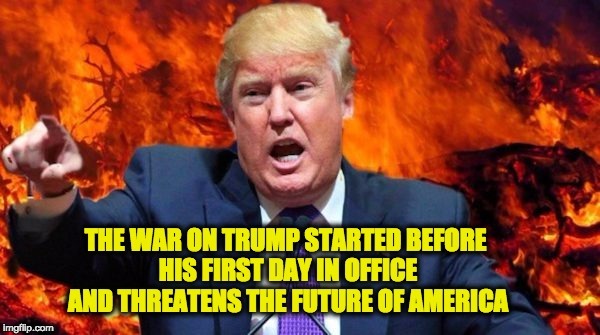 Now, it’s all-out war on Trump. Then it was war on Iraq. Reporting hearsay as truth and failing to verify stories were all in a day’s work on cable and news networks. A Geiger counter that went off in the inexpert hands of a marine, stationed in Iraq, became “Breaking News,” possible evidence of weapons-grade plutonium. Every bottle of Cipro tablets located was deemed a likely precursor to an anthrax factory. Anchormen and women somberly seconded these “finds,” seldom bothering to issue retractions. To comprehend the hysterical mass contagion that is the war on Trump it’s essential to trace the contours of that other war, “Operation Iraqi Freedom,” and the way it was peddled to the American public. The war on Trump could end badly. By “badly,” I don’t mean the violent silencing of conservative speakers, the firebombing of Republican Party headquarters (October, 2016). Or, the attempted murder of Republicans representatives (June, 2017). These are barbaric. But if past is prologue; the frenzy of inflamed imaginations could spill over into all-out war—against Russia, Iran, North Korea.